Our retreat group! Yes, we all bonded! This is part of a sponsored campaign with Being Latino and Cox Communications. However, all opinions expressed are my own. I’m part of the #CoxGIGLife campaign for the Phoenix area and today’s assignment is to talk about how high speed Internet allows us to get things done faster. 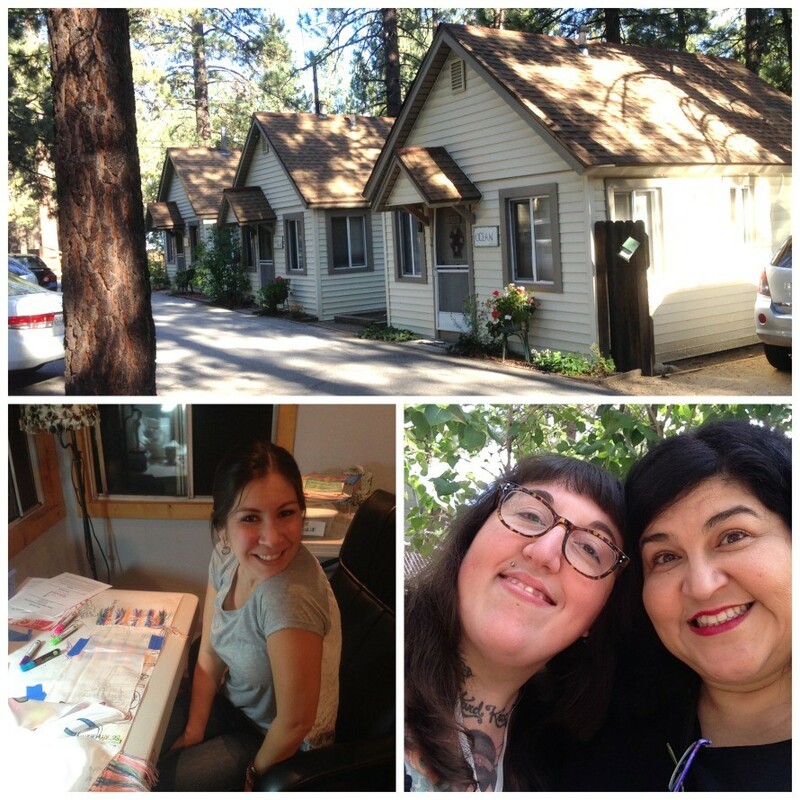 The first thing that came to mind was my first-ever Crafty Chica retreat! I organized the entire event online and am proud to say it went off beautifully! 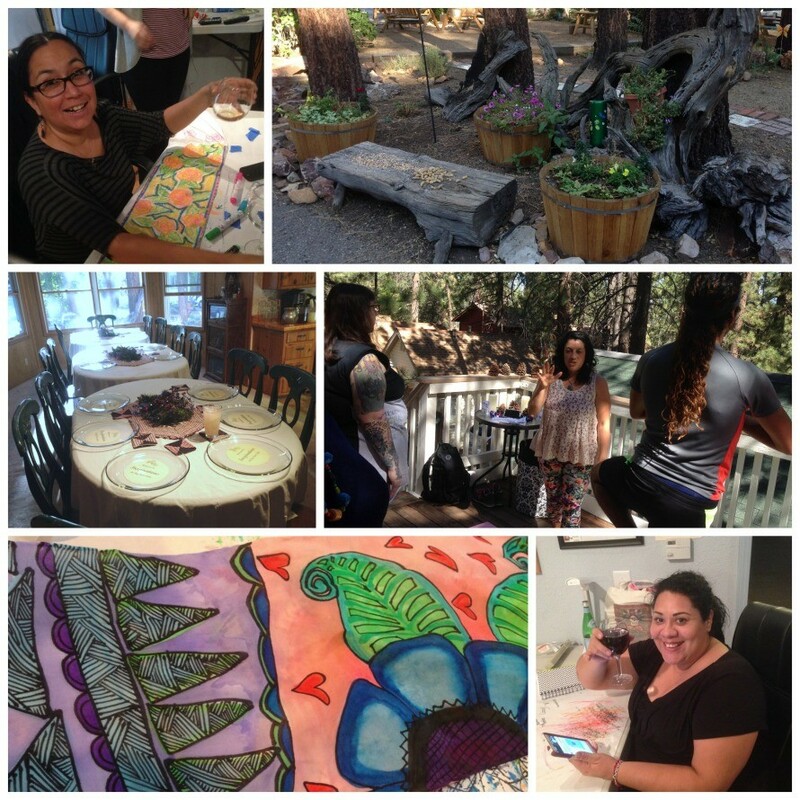 We spent three days at Big Bear, CA to energize our creative businesses. I wanted to share what I’ve learned from Crafty Chica with others! I know there are a lot of videos and messages about unplugging to find your life and I agree with those to a point. But you know what? Many of my best friends these days are all people I met directly or indirectly online. They started as virtual friends and are now real life friends. And those friendships have allowed me to travel around the country to see and meet them in person. 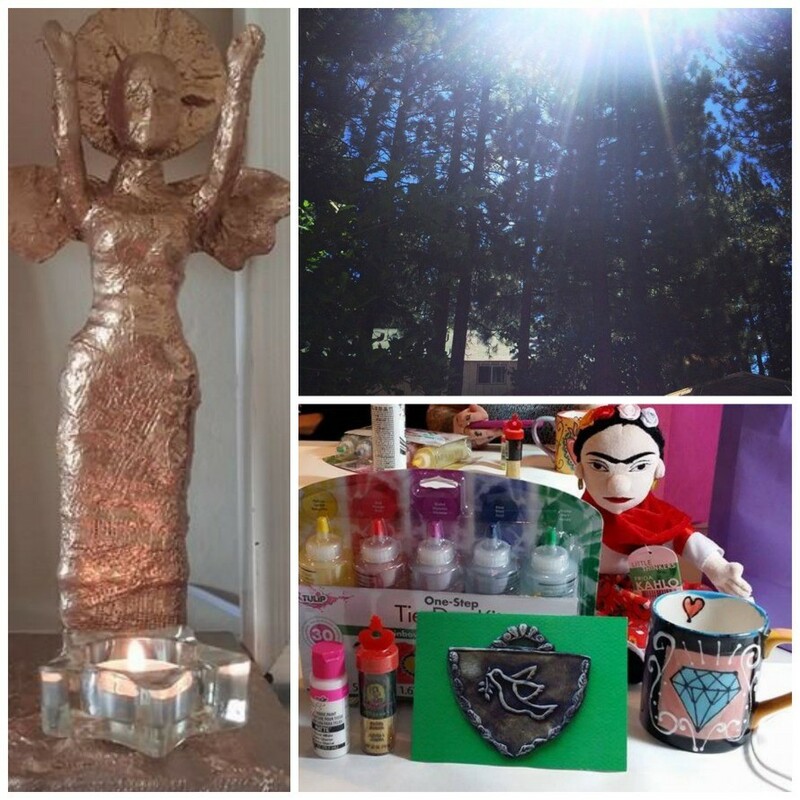 Silvia’s handmade empowerment guardian, our swag bag contents and lovely sun rays! 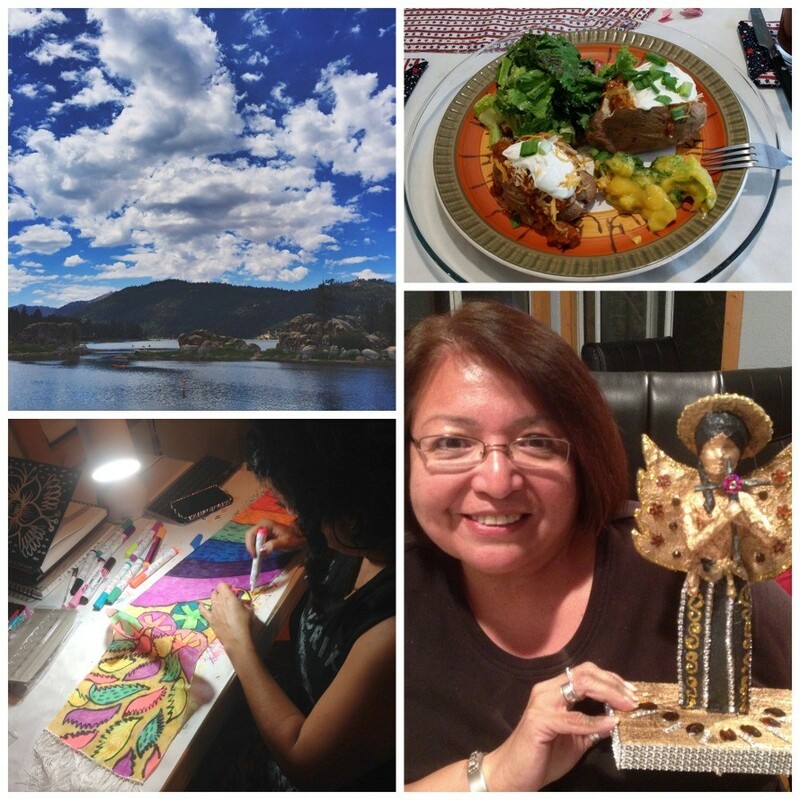 As a full-time blogger, artist and writer, a lot of what I do involves being connected online. I’ve been a Cox Communications customer for 18 years and have always subscribed to the highest power Internet service they offer. I have a lot to get done online – so I can write, plan and create offline! I don’t have time for slow Internet! Look at those clouds on the lake! One of our meals, coloring scarves and our other Sylvia showing off her Mariachi angel she made! Here are some pictures from the retreat. It was themed around running a creative business. These are all women who have book, art, or lifestyle blogs and are looking for ways to grow their brands. I used Google Drive to put together all the documents and forms to keep everything in check. I used PicMonkey to make my promo graphics and my blog and Facebook to let the world know. I was able to visit each guests web site before the retreat to be prepared for the context of their questions. Once that was all finished I had time to go up to Big Bear and enjoy the retreat! Three of the cabins, Miss Rina, and me with Sage! We made three projects – an empowerment angel, an affirmation scarf, and a word power metal-stamped necklace. During the day, we broke out the handbooks I made and I shared all my experience about branding and blogging. Every one took a turn sharing their story too. It was healing and motivating for all of us! We also even had “visualization yoga” with Silvia from Rocksteady Yoga. Her sessions that were so powerful, at the end of each one we opened our eyes to find tears streaming down our faces! She talked us through taking control of our inner-critic, silencing her, and focusing on our best qualities. 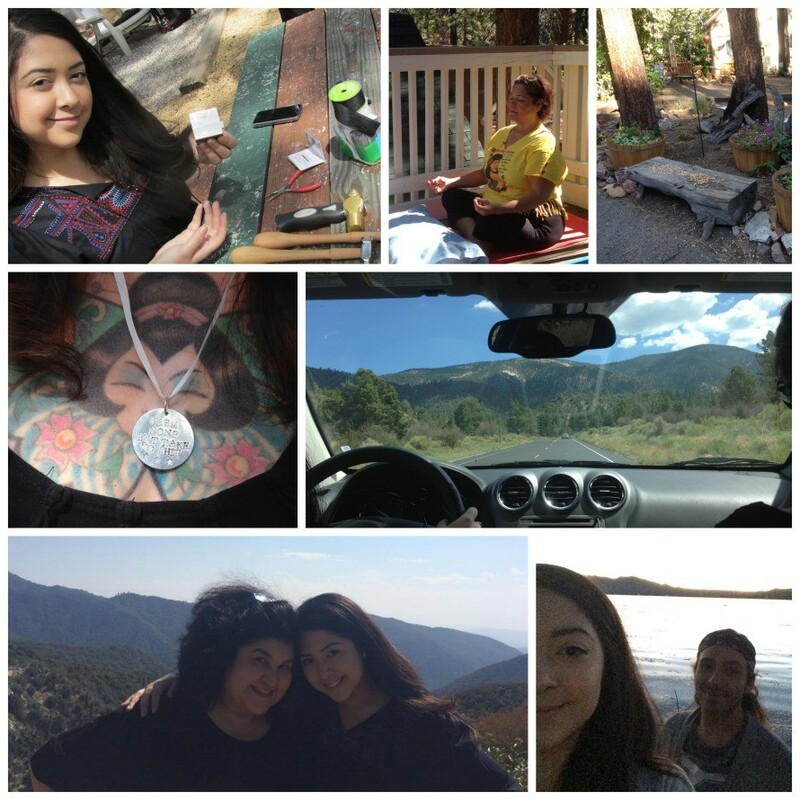 Yoga, wine, crafting, meditation, business planning! This retreat started as a small idea that I didn’t think I would have time for. It grew into a wonderful experience for everyone. We had women from all over the country join us and I was so moved by all their stories about why they got into the creative arts. And to think it all came through having a fast Internet connection…honestly, with all that is involved with organizing an event like this, if I had a shoddy Internet connection, I wouldn’t have the patience to deal! I love that with Cox One GIG Internet you can download 100 songs in 3 seconds (for me this would be audiobooks! ), an HD movie in less than 60 seconds and upload 1,000 photos in about a minute. Visit http://bit.ly/1uiNzB6 to find out more. And the cool thing is that all this is happening with all four of us in the house running our devices at the same time. And don’t forget to visit coxcomm.tumblr.com too! If you live in Phoenix, check out the Gig Life Experience! On Diamondback baseball game days now through August 10th, you can visit the Cox GIG Life Experience at Chase Field Plaza at 4th and Jefferson! The event will begin two-and-a-half hours before the first pitch. 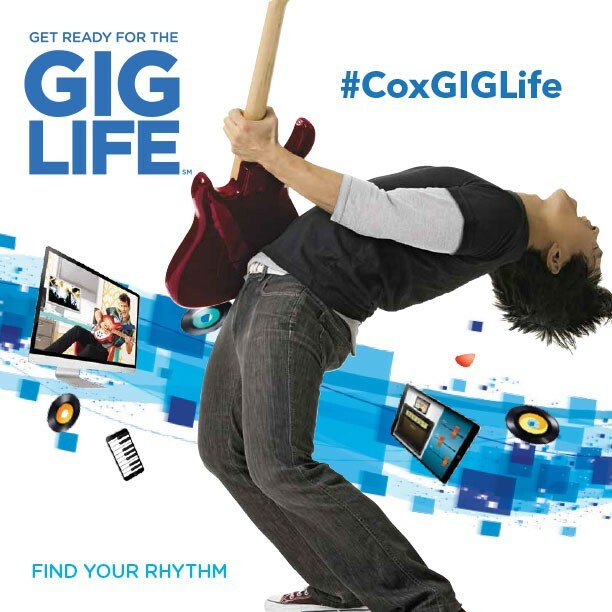 Once you’re there, you can give the Cox GIG Life Experience a spin! You’ll test out how to stream exclusive content on devices via Cox WiFi from Fox Sports Arizona and the Arizona Diamondback. Even better, there will be games and giveaways – including a $500 iTunes gift card and an iPad! If you are are a Cox customer and interested in joining in the fun, you can purchase discounted Diamondback tickets atwww.dbacks.com/coxoffer and use code COXGIGIT. Here’s something else that’s cool – if you are already a Cox Communications Internet customer, you’ll be happy to know that they are doubling the speed for FREE for Preferred (was 25 mbps, now 50) and Premier (was 50 mbps,now 100) packages. Check out your plan to see what you have . The upgrade is automatic and all it takes to activate it is a reset of your modem. Next ArticleHappy Lefthanders Day + Lettering Tips!